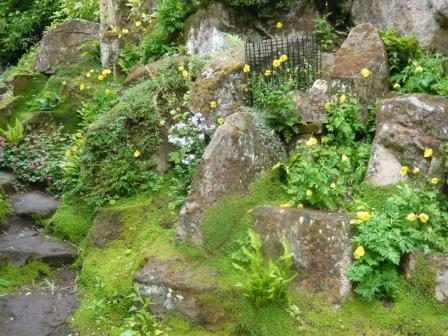 Plants that grow in this low rockery include spring bulbs, Primulas, Aubretia, Campanulas, Saxifrages and low growing conifers. 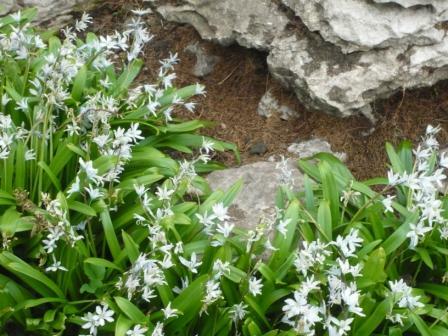 The careful selection of plants can provide colour throught out the seasons eventhough Spring is seen as the key time for Rockery flowers. If you are planning to build a rock garden (and I suggest you do need to plan) then here are a few tips that will help you avoid some of the problems I have encountered. Modern rock gardens can be a collection of standing stones looking like abstract sculptures, a formal Zen like Oriental space or a gravel garden with shapely rocks and rectangular constructions. 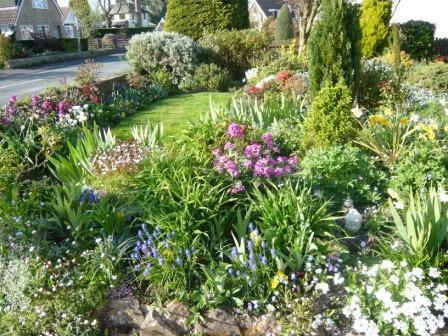 I favour the informal Alpinesque Rockery that is primarily designed to provide a variety of habitats for plants. Consider the gradient in your garden as sloping gardens can be difficult to landscape in a formal manner. An informal Rockery needs to be firmly anchored with standing places for maintenance and culture. Aim for rocks with texture and character that harmonise with the local environment. Site your rocks in a display that is a pleasing feature in its own right before any planting. Consider the background, whilst most plants may be low growing a green shrubby background may set off the whole feature. Use local stone that fits in rather than detracts from the environment. If you have granite or slate locally then pale limestone can look very out of place. Aim for large stones as at least one third will be buried and size does matter. Try local quarries for stone rejected by builders as unsuitable for their purposes or salvage yards and tips. Do not skimp on the quality and quantity of stone. Work out your budget to get as big a rockery as possible with enough rocks without going bankrupt in the process. Arrange a transition area between the rockery and formal parts of the garden such as an edging or path with small stones or tufty grasses. Plan each stones placement with a staggered or layered effect from the main viewing point(s). Create planting pockets and space plus horizontal and vertical planting crevices. Place stones tilted backwards so they protect plants and do not cause water to run on to them causing rotting. Aim to keep the rock strata evenly matched and running in the same direction not just piled up or sprinkled aimlessly.